Ok so just now i was thinking about where did it all start? We have an idea that there is a big bang, and scientists are pretty sure that the universe, expands and then contracts.. ok i can accept all that. But they also surmise that this expanding and contracting is infinate. ... and if it is as some people believe by god, then who created God and if it was those three mythical beings then who created the creators. How does something just start with no preamble, no prefix.... where did it start? We don't know. There are so many things we simply don't know about... but slowly we are coming to a more complete picture. 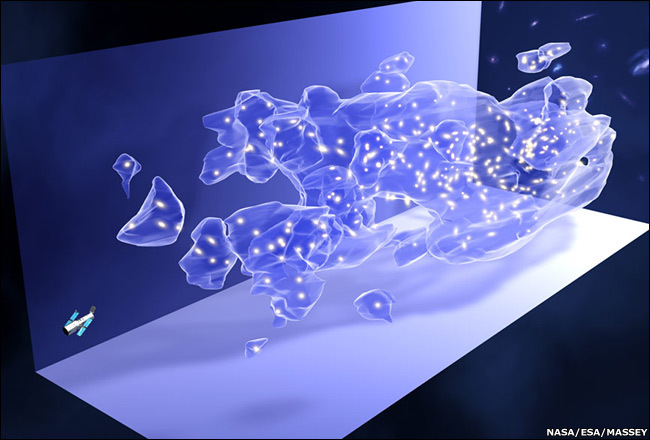 For example, recently scientists made the first dark matter map, which they believe to be the "scaffolding" of the universe. The Earth is an infinitesimally small percentage of normal matter. So you can imagine how much we simply have no clue about. As for God (he, she, it, they) was created by people like you and I trying to make some sense of the mystery of it all. And there was me thinking it was going to be another one of those xp-erience -> ntfs -> osnn threads! Vanq, please do not quote images in your posts. Thank you. He is saying that religion was invented by people you and I who were looking for an answer for unanswerable questions. Thankfully with modern technology we are starting to understand the universe and those unanswerable questions are slowly being understood and then eventually answered. this is what i have been saying, in my thread for 3 months! It was in my sig, until i felt compelled to change over to the patriots. It makes me laugh when I read that scientists know how old the universe is, what it's made of, etc. -- all while failing to understand the current weather on our planet. This year was supposed to have a more severe hurricane season than 2005. Not close, or even remotely close. It's also interesting that it's viewed as stupid, ignorant, or (choose your adjective) to have faith in God, while it makes complete sense to have faith in people who pitch theories with worse odds than winning the lottery 10 times without ever having actually played. Slight exaggeration, but you get the point. If you believe in infinite space, then you should also believe in infinite time. If you believe in infinite time then you should acknowledge that a "beginning" doesn't exist in the sense that we understand it. It's an interesting conversation, lancer, with a question that obviously none of us (nor anyone) can answer. No reason not to discuss it, though! Hey God farted, and that's where we get the "big bang" from. I assume you are trying to make a point about wasted space and how madmatt wasted space by even posting that. Doesn't it seem a bit hypocritical to be posting nonsense like that? I suppose my post here is a complete waste. Hell, this thread should just be locked and deleted because its wasting space. I have been in enough religion discussions to know that it is highly unlikely this will turn out well. Someone will get mad, offended other people will get defensive, etc etc. When it comes to topics like this, people don't usually change their mind and I don't see the point of even discussing it. Then whats the point of having a brain if you aren't willing to use it? I never said anything about not thinking for yourself. What I was implying is that people hang onto their beliefs for dear life. People's views on this type of subject are usually so deeply rooted in your life the very idea of questioning the foundation of their life has consequences. Most people don't want to think about it, therefor discussions such as this turn into flame wars and can be frustrating and stressful for both sides. Like I said, I have been in enough of these discussions to know better. I have strong feelings on the subject, and I know others here don't agree with me. I'm willing to show them the respect they deserve by not questioning their beliefs. I don't need to prove others wrong to justify my beliefs or make myself feel better, And the same goes for the other way around. We are all entitled to what we want to believe in.